Like most of my “recipes” (picture me doing finger quotes here), it’s pretty much the result of experimentation and trial & error. Oh, and I don’t measure anything. 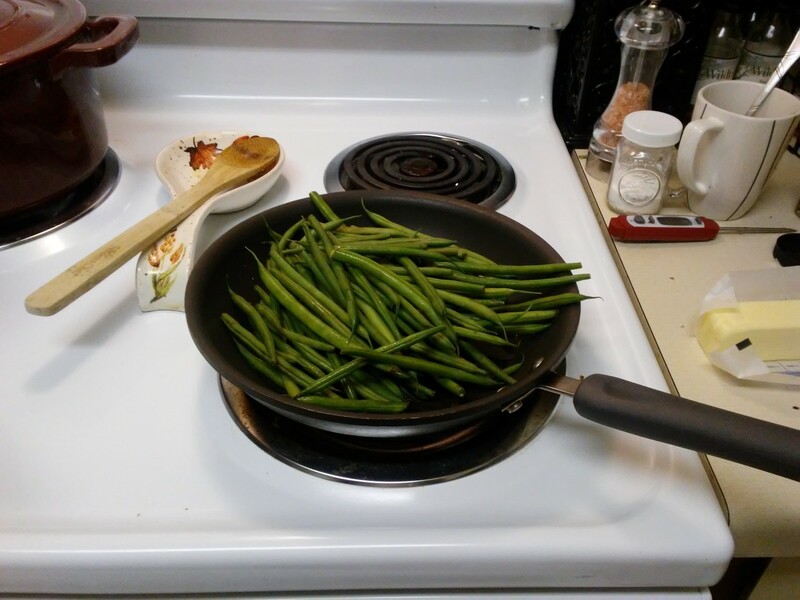 Unlike baking, I’ve discovered stove-top cooking is much more forgiving of mistakes and the “pinch of this, handful of that” kind of measuring. 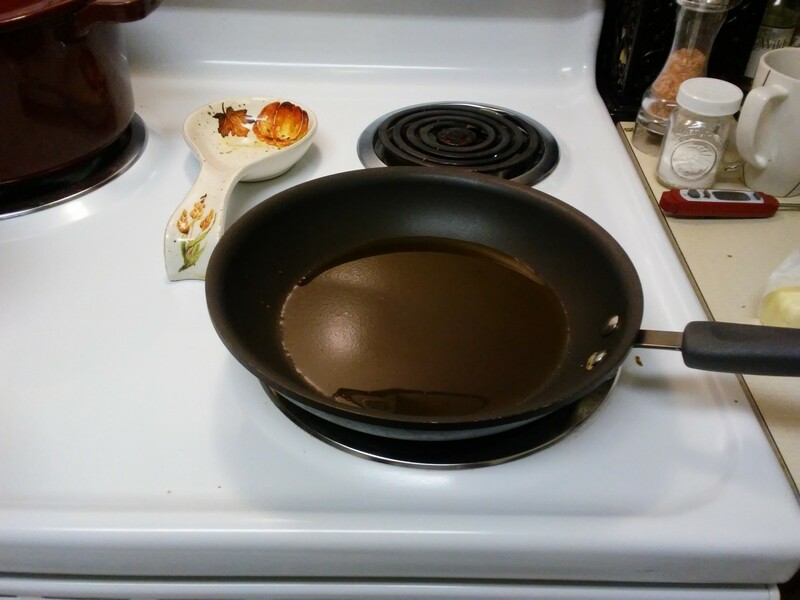 That said, I do usually start out with a measured amount of olive oil, about two tablespoons. I let that sit on medium heat for a minute or two, just enough to get it hot. Grab a handful of beans and toss ’em on. No, I don’t know how many. A big handful. I have medium size hands, if you must know. The first step to a good meal is adding garlic. 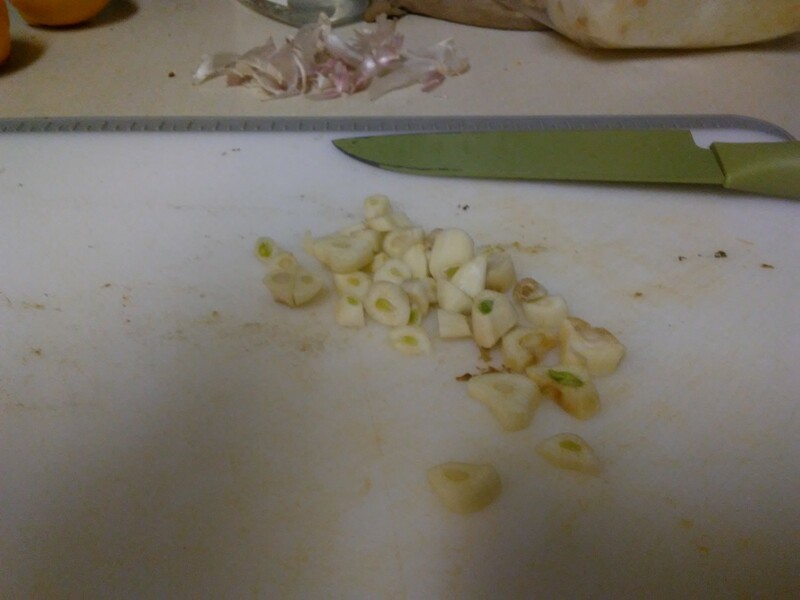 Chop up some garlic. I don’t know how much, because that will depend on how much you love garlic. Probably a lot, if you’re like me. Toss on the chopped garlic, and maybe throw on some minced garlic also. The chopped garlic will get nice and crunchy. Something I used to do, but don’t anymore, is sprinkle on some garlic and onion powder. I would love to include it, but I always end up burning it. I’m sure a more seasoned chef could include them more successfully than I. 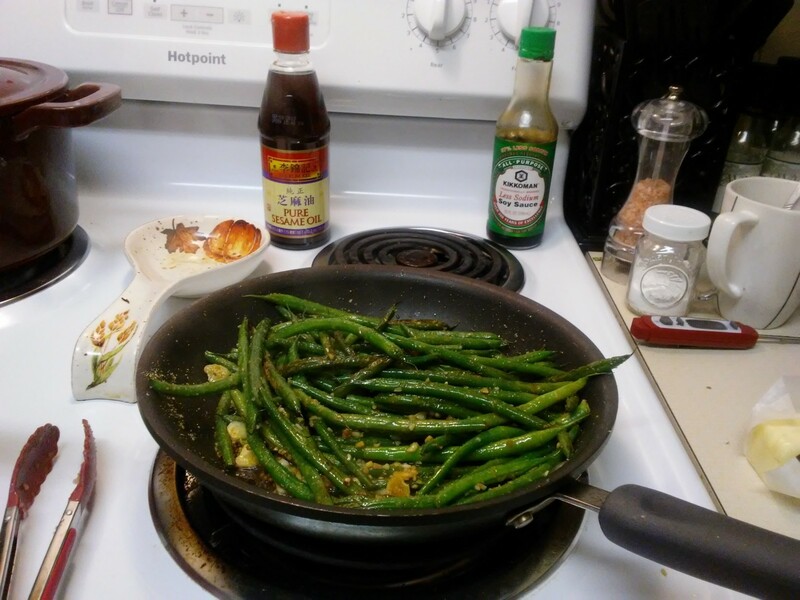 To add a little more flavor, lightly sprinkle on some sesame oil and soy sauce. Being sensitive to salt (not in any medical capacity, I just don’t like to taste the salt directly), I prefer low sodium soy sauce. No, I don’t have any measurements for you. Just… I don’t know, three or four swishes or something. Whatever, do what you want. 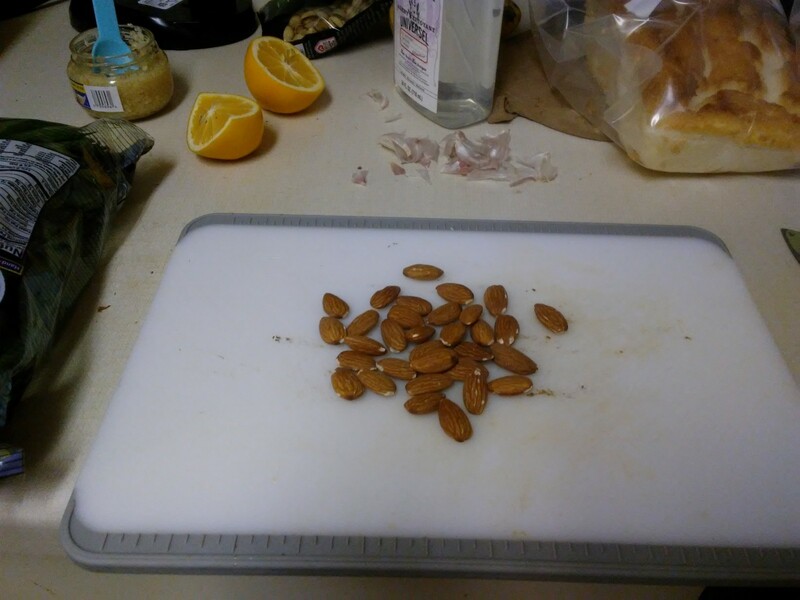 Now comes my favorite part, almonds! (Come to think of it, it’s Jessica’s and Namine’s favorite part, too.) Grab a handful of almonds (we always have some in the freezer) and put them in with the beans for a minute or two. Sometimes I chop them up into sliver-ish sizes, sometimes I just cut them in half. 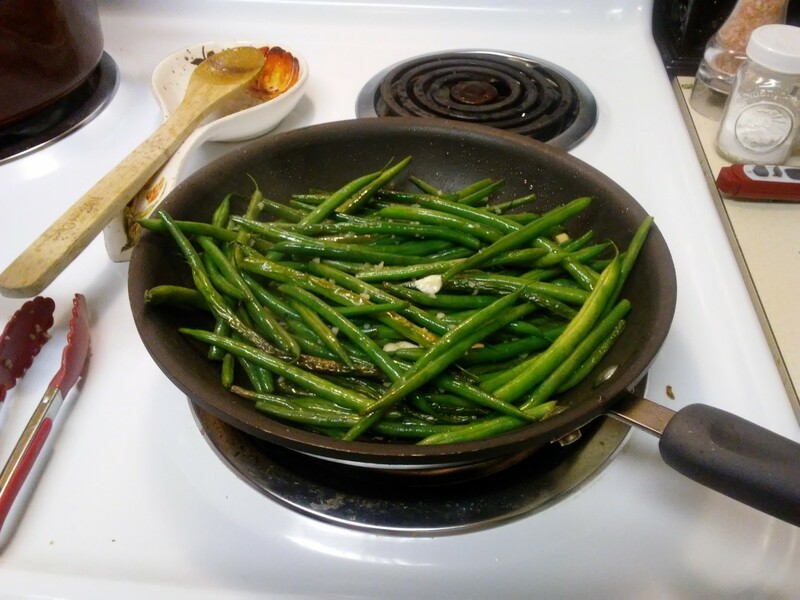 And there you have it: green beans a la Paul. 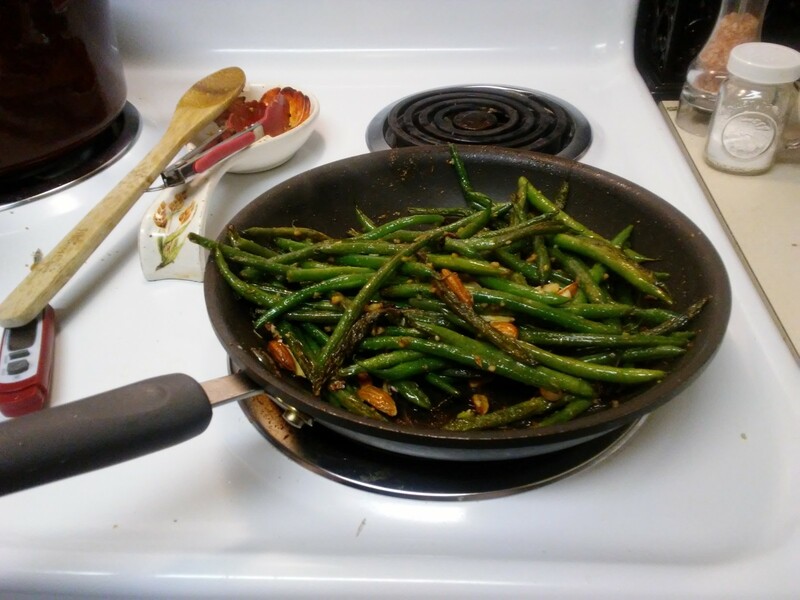 I don’t profess to be any great chef or anything — in many ways I’m still a cooking padawan — but my family likes it, and that’s a success in my book.